Shane Gibson, Sycamore’s Environmental Education Director, photographed this monarch caterpillar on swamp milkweed in his backyard. 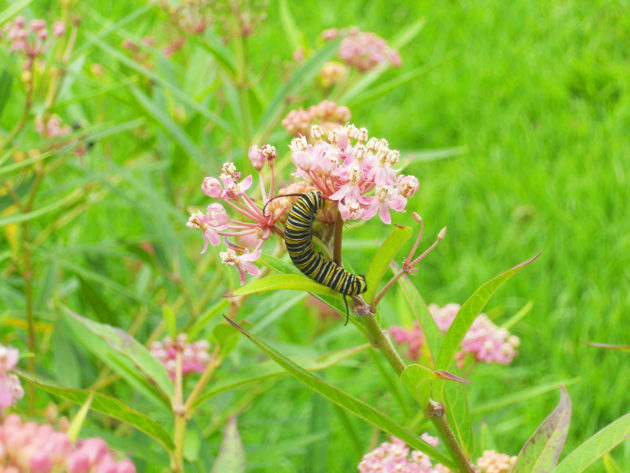 Milkweeds are the only plants these important pollinators can eat in their caterpillar stage. Many Sycamore supporters are concerned about the collapse of bee populations and the plight of other pollinators, including monarch butterflies. In fact, scientists fear this iconic insect and its amazing and epic migration could vanish in our lifetime. The eastern population of monarchs, which numbered over 700 million in the early 1990s, has declined by nearly 90% in the past 20 years. The smaller western population that winters in southern California has experienced a similar drastic decline. Habitat loss on the breeding and wintering grounds combined with increased pesticide use, parasites, and climate change are pushing the monarch to the brink. But could something so abundant actually go extinct so quickly? We don’t have to look too far for the answer. The very last passenger pigeon, Martha, died just over a 100 years ago, not far from here at the Cincinnati Zoo. The last confirmed wild passenger pigeon was killed in southeastern Indiana just a few years before that. A species that once numbered 3-5 billion went extinct in 40 years. Will the monarch face a similar fate? At Sycamore, we’re optimistic that humans have learned from the past and won’t make the same mistake again. And we’re taking action. Since habitat loss is one major contributor to the monarchs’ decline, Sycamore is actively working to restore places where they can safely breed, find shelter, and store up fat for the long migration. This includes planting native milkweeds at our nature preserves and in the native plant gardens that we create with students on schoolyards. In 2017, Sycamore started participating in the monarch tagging project. Volunteers met up with staff to gently catch butterflies at our Powell Preserve in Monroe County, stick tiny numbered tags on their thoraxes, and set them free. We held this event in September to be sure we were tagging the generation that would migrate to Mexico. When scientists there find the bodies of butterflies that have succeeded on the long journey, they’ll send us an alert. 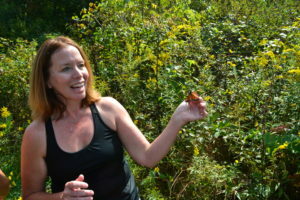 Rebekah Fielder holding a monarch butterfly caught at the Powell Preserve, to tag it for a monitoring project. year. Even more incredible is that they all fly to the same small, remote wintering location in Mexico. Their migration is similar to the migration many birds undertake each year. However, a monarch only makes the journey once in its lifetime, if at all, and doesn’t have experienced individuals to lead the way. The tagging project helps monitor the health of the monarch population by tracking where they come from and how many are safely making the long trek. As we continue to restore their habitat, we hope these fascinating creatures will come back to a welcoming environment in southern Indiana, in greater numbers every year. Want to get involved? Check future issues of The Twig for our next monarch tagging event! And no matter the size of your yard, you can create pollinator habitat by growing native plants and limiting pesticide use.